I never intended to review any digital camera that didn't have cheap, removable media. I have a Sony Mavica MVC-FD7 and in spite of a few problems, I am getting good "Web quality" pictures. Since I take lots of pictures (over 5,000 so far, this year alone), I loved the quick, easy, low cost, removable diskette media of the Sony, instead of having to run to a laptop to "dock and download" or having to carry around expensive "silicon media". This article describes my recent usage of a Nikon 900S digital camera for a week. I was invited to the Indy 500 race by Oldsmobile, due to our Auto publication startup, Reviews OnLine Auto,and I wanted to bring another camera, in addition to my Sony Mavica. When I was not able to obtain a newer model Sony, to compare and contrast at this international event, I called a friend and borrowed a Nikon 900S digital camera. It had an 8 megabyte Compact Flash memory card and he told me that it went through batteries fairly quickly and to buy extra batteries. On the trip home with the camera, I couldn't wait to take pictures. I snapped a few, at stoplights, through the windshield and they looked really good in the viewfinder, but so does the Sony. I took these pictures at the best resolution the camera has (1280x960), since I wanted to see the camera at its best. The viewfinder had a brighter tone than I was used to and it looked better than the actual scene itself. Since I was almost out of "film" (the 8 megabyte Compact Flash was almost full), when I got home, I quickly called SanDisk to get the largest memory cards I could. SanDisk provided both a 40 megabyte and a whopping 96 megabyte Compact Flash memory card for this review. Now I had some serious memory - enough to take pictures for more than a few minutes, so I bought some Duracell AA batteries on sale and headed off to Navy Pier to cover the last day of the AS/400 Show that I had written about a few days before. I had probably taken over 3,000 pictures in a trade show environment, so I wanted to get a sense of how this camera worked in that harsh environment with the glaring lights. I wasn't used to the camera, so I made some mistakes. I now realize that the most important fact to remember when taking pictures with the Nikon 900S is to push the shutter button partially down, WAIT for the camera to FOCUS and THEN take the picture. I didn't know this, at the time, so I happily snapped away without waiting. When I got home and viewed the results, there were several blurred pictures amongst some really great ones. I was also taking similar pictures with the Sony Mavica MVC-FD7 so I had comparison shots for part two of this article. Shooting a subject that has a strong light in the background will cause the Nikon's LCD screen to "stripe" downward, just like the Mavica. But this stripe ISN'T in the picture, just in the viewfinder, so it's NOT a problem. In fact, you can take a picture of a glowing light bulb with this camera and get NO stripe. Super. My Sony Mavica FD7 gets this digital "streak" and it's in the picture, so I have to make sure I don't take a picture in this lighting situation or the resulting picture may be useless. The camera burns up batteries, but the problem is solvable. The batteries also get very warm after continuous picture taking. I shot 150 pictures and went through a dozen brand new batteries. I used to get mad because I have to carry an extra battery for my Sony Mavica, in order to shoot for an entire day (250+ pictures) - I didn't realize how lucky I was. After knowing that it would cost a small fortune to shoot the Indy 500 with conventional AA batteries (and I would have to carry a bag just for batteries), I decided to make a call to small company I had heard of in Michigan - Harding Energy. They make Quest batteries. You may not have heard of them, but if you have a digital camera that uses AA batteries, you need to try these Quest batteries! At the Indy 500, I was able to shoot the entire race using a single set of four Gold Quest batteries. I had four more Gold and eight more Quest Green (less power, lower cost) batteries in reserve, but I didn't need them. The Sony battery ran out at about the same time. This was again incredible, since few cameras can keep up with Sony's long battery life. The 2X digital zoom isn't useful. I thought it might be handy, but it really isn't. I don't think it has any useful value other than as a digital "telescope" to see distant objects. The resulting picture is obviously grainier than those taken without the digital zoom and only when reduced by 50% does the picture look smooth and sharp. So why make your picture taking more difficult with this 2X digital zoom? If you are shooting far away objects and want to make them bigger, shoot with the longest lens you have, optically, and then digitally enlarge the picture. You will still have the "grain", but you have more area to crop from, since the picture area will be FOUR times larger. I wished I had realized this when I was taking pictures of seagulls off Navy Pier. It would have been much easier to follow the action of these diving birds. The built-in viewfinder is very handy. 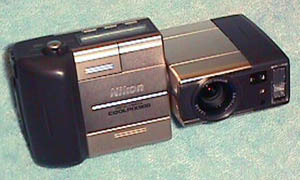 The LCD is difficult to use in the sun, because the picture washes out, but the Nikon 900S also has a viewfinder. And the more light, the better. I don't know why all digital cameras don't have either viewfinders or through the lens viewing. This feature is very handy, especially for sports action in sunlight. Nikon also placed the autofocus LED near the viewfinder, so you can see its blinking status in your peripheral vision and this makes taking action pictures, with the viewfinder, very easy. Great job, Nikon. Did I mention that pictures were great and the resolution was superb? The zoom is too small a ratio (3X). I wish the zoom was longer and in the next part of this article, I will show an example of a similar picture taken by both cameras at maximum zoom. Although the Sony has a lower resolution, with its very powerful zoom lens, you can use all of its resolution in the area you want, so you get more pixels of your subject than you can with the Nikon camera. But, if you are doing scenic vistas or other wide angle style pictures, the Nikon wins - hands down. But I already mentioned that the pictures are outstanding. Downloading the pictures to a laptop wasn't hard. Downloading them as quickly to a desktop system without a PCMCIA/PC Card slot is a bit more difficult. I ended up setting up a small 10 based T local area network (LAN) between the two machines. - Overkill - but very speedy for the hundreds of pictures I had to transfer. When you have to download a 96 megabyte Compact Flash card, I advise getting a PCMCIA port (and PCMCIA adapter card) for your computer if it doesn't have one. Using the supplied cable to download pictures directly from the camera is not as bad as it sounds and you can view smaller, lower resolution versions of each picture (thumbnails) from the camera within a few moments. This viewing and transmission software is extremely useful to use, even if you never transmit a single picture with the cable. The Nikon 900S records the exposure information for each shot, and this software can display both an f-stop and a shutter speed for each picture, along with the usual date and time. Unreal! I only wish there was a way to show this information in a table format, for all the pictures at once, instead of having to click each thumbnail, but the information was nice to have. Big Compact Flash memory cards are handy. I shot the entire Indy 500 race (and I was also shooting with the Mavica MVC-FD7) on a single 96 megabyte card (I shot 20 VGA sized and over 100 high resolution pictures.). Again, I didn't have to change "film" ever during the race. This memory card is small enough that I easily carried extra cards, so I wouldn't have to "download". Again, the pictures were incredible. For the Web, I got superb pictures that were so big I had reduce them in half just to get them to fit on reasonably sized Web page. I had to cut them down in half again to use in them in an article. No longer did I have to accept a grainy 640x480 picture! I love having lots of picture quality. 1. Get the largest Compact Flash card you can afford or that will hold the maximum number of pictures you intend to take until your next download. The supplied 8 megabyte card is not enough. 2. Buy the Quest batteries. They will save you money. Oh, I almost forgot to mention that these batteries are RECHARGEABLE. A set of four (Gold), with charger, is $34.95 - half of a Sony replacement battery and one third of a Sony charger. 3. Remember to watch that autofocus light! If it is blinking, DON'T take the picture, since the camera either can't focus, or is in the process of focusing. Either way, if you take the picture while it is blinking you will probably get a blurry picture. Overall, I was very impressed by this camera, and although there are some user interface features that could be improved, this camera performed the most important task people use cameras for, digital or film - It takes great pictures!